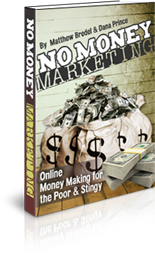 Those who buy a membership to Tru-Guru get several free bonuses and one of them is this book that’s filled with ideas of how to make money on the internet without an initial investment. Of course you’ll have paid the small subscription fee to get the free book but I do assure you, there are a lot of great ideas in there and the Tru-Guru subscription can be cancelled at any time (plus offers a money back guarantee). Some people look for work at home jobs to make extra money. But many of them soon realize that there is a huge potential for a home-based business that you’re the boss of instead. Instead of working for someone else, you could start several different types of online businesses such as: affiliate marketing biz, creating an online dropshipping store, to create and market your own products, and more. The most important aspect of searching for income opportunities on the web is research and Matthew Bredel has bundled several years of trial, error, research, and great results into his informative products. Check out his free SEO Exciter Series to get a free sampling of his helpful teaching style when he shows you more than the basics of how he uses organic search engine optimization techniques to dominate the search engines in his niche (bringing him traffic and profit!). I’d love your feedback on what you think of the book and the Tru-Guru program. Cheers to your online success!